As we give honor and recognition to the annual celebration of the Chinese New Year here in the Philippines, homify brings you a special ideabook that will surely have you start shopping for red furniture and accessories for your home! 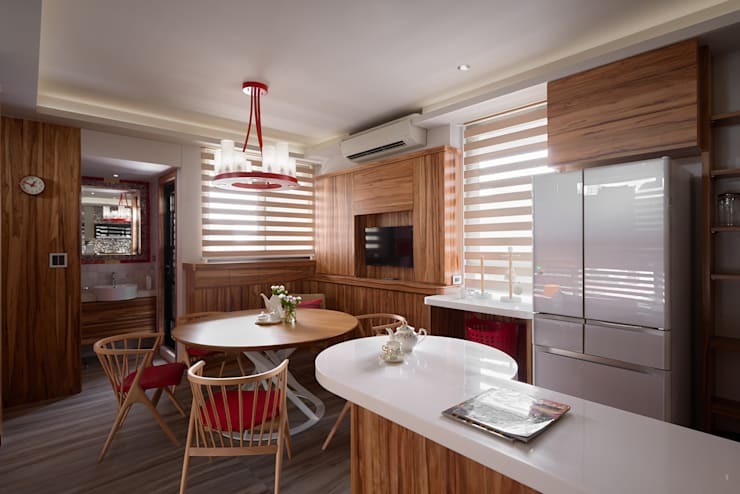 For homeowners who are not familiar with the Chinese belief in terms of interior designing, the color Red is actually ought to be a very lucky color. The red color is a symbol of fortune and prosperity in China and it is picked for the room designs. Having these Chinese designs will enhance the beauty of Asia in your house. It is like entering peaceful gateway for the best relaxation, combining between luxury, tradition and modern looks. Keep on scrolling to see 13 red-iculously stunning ideas for your Chinese-inspired home. 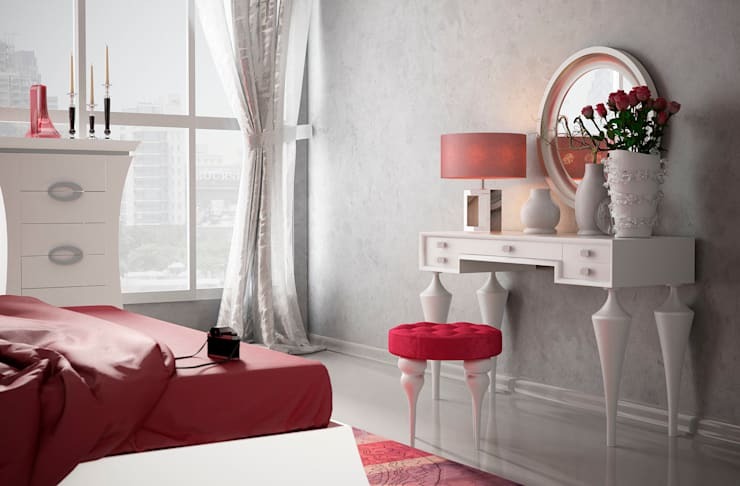 Add pops of red to your neutral bedroom by spicing up with a couple accent tables. 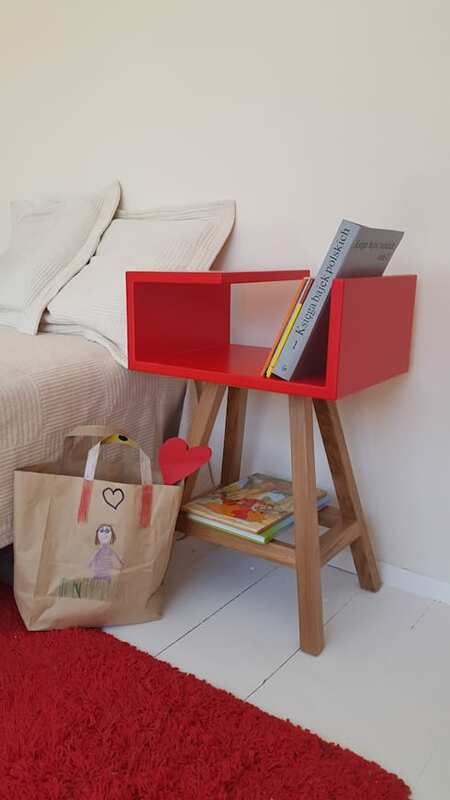 Side tables not only act their function of carrying valuables in your bedroom, but also holds the power of accentuating colors in the room like shades of Red. Keep your kitchen and dining area cozy and traditional with an all-wooden approach to interior design. But don't stop your style aspirations there -- add a splash of good luck by decorating your chairs with some comfy seat cushions! Red here, Red there, Red everywhere! Don't be afraid to splatter all the good luck in your house, go all out with your decorating skills with the color Red! Red is a powerful color, thus, it is imperative that a homeowner must know how to keep it not too overwhelming nor overpowering. If you're doing a DIY project, make sure to keep some elements stick with a neutral tone or something very conservative to balance it out with Red. If you're not sure on where to start, it's better to hire a professional interior designer instead. What's the spirit of Chinese culture without some Chinese decor? Decorate your Filipino home with some authentic and traditional Chinese lanterns and wall pieces like in this room pictured above. Tasty Red art and decor! 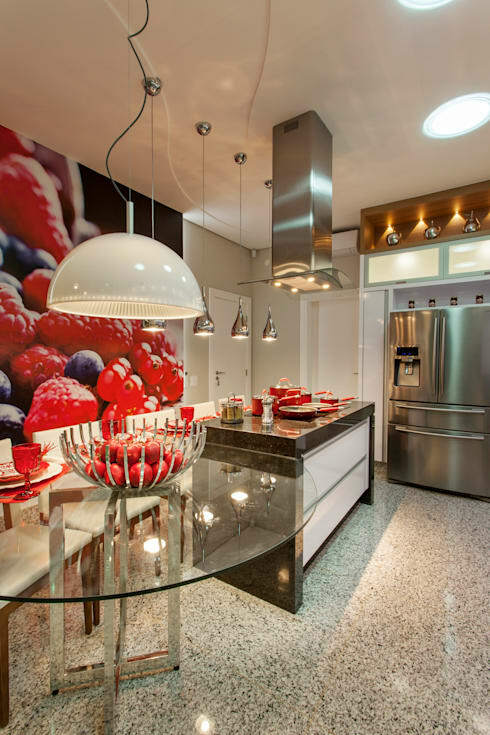 Whatever your taste in kitchen style is, Red always makes it look more scrumptious! Check out this sleek and vibrant kitchen -- the metal elements in the area oozes pure industrial style, and the pops of Red through the big wall painting and decor adds a an ounce of vibrancy in the kitchen. 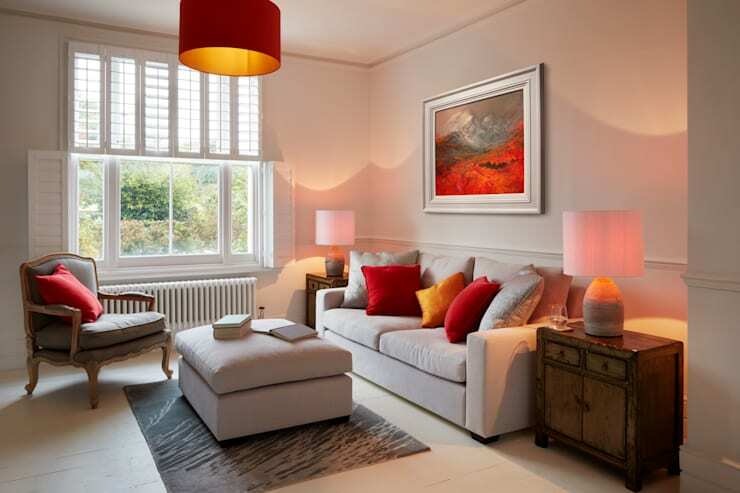 Red comes in all hues and tones, and shades of Red can promote different feels and characteristics to the room. In this stylish living room design, warmth and a sense of amiability is exuded all over. The pillows, lighting fixture, and wall painting showcases very warm hues of Red and Orange that instantly welcome any guest in the living room. As mentioned above, Red comes in all kinds of shades. In this sweet looking bedroom, the feature of Red here range hues from a pale rose tone to a bold magenta color. Even the tiniest details or the most intricate, small embroideries could make a ton of difference to your room! Decorate any room with patterned textiles that feature Red. 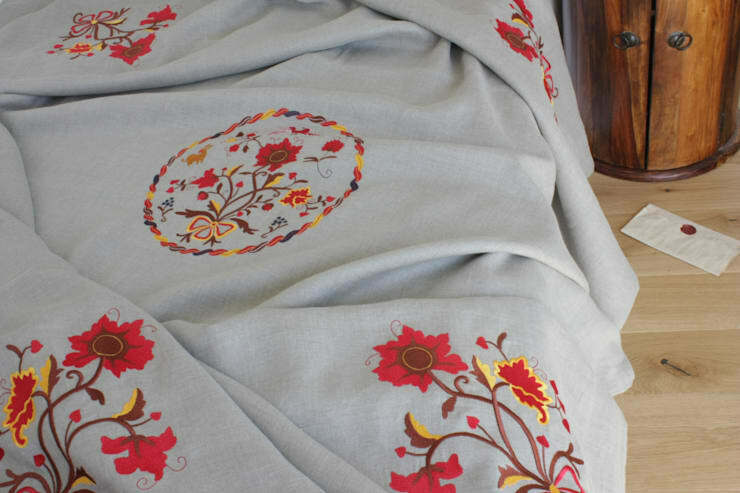 Pictured above, this pale-colored bed sheet is beautifully printed with florals in Red. Torn between having a minimalist room or a dramatic one? Get the best of both worlds with this striking design from Dekoori. 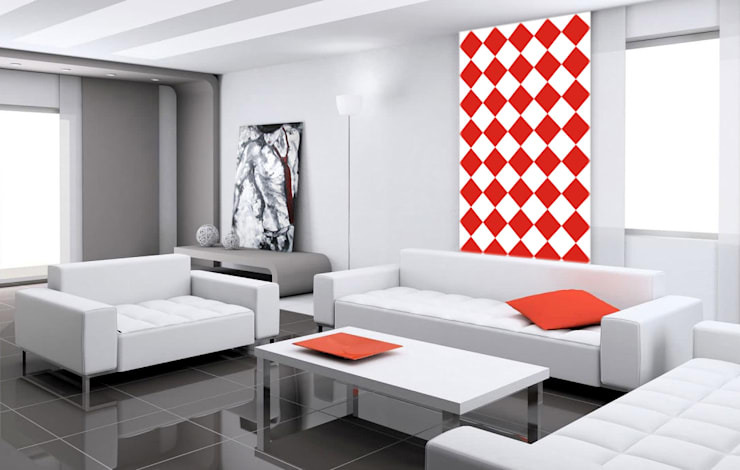 It showcases a smooth and sleek approach to the minimalist style and also boasts a dramatic effect with its Red decor. You have to admit, this wall decor is just awe-mazing ! The best way to add touches of Red to your interiors is by simply investing in figurines, knick-knacks (for the old-fashioned), and decor. 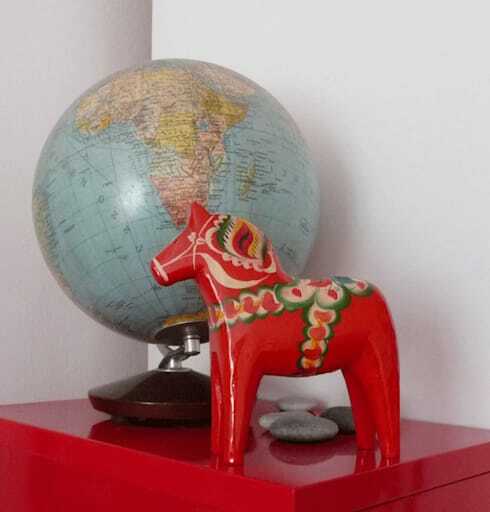 Above you will see a stylish side of the room where a small horse statuette adds zing to the style. Keep your walls, ceiling, and floors neutral and boast your Red colors through the textiles! 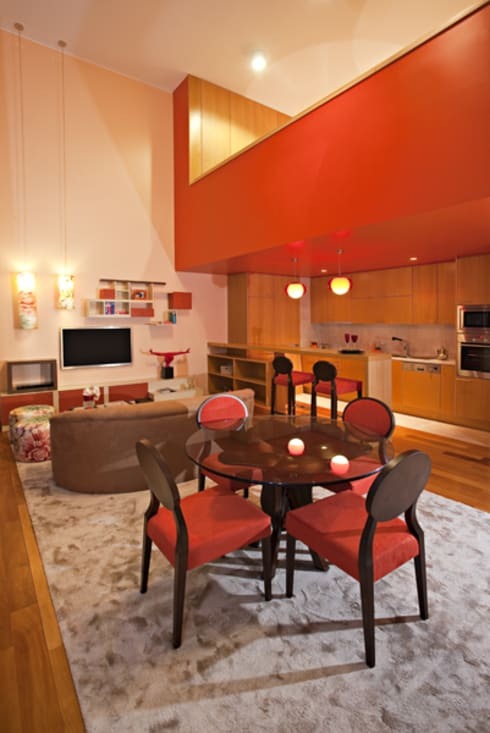 Check out this bold living room design where Red is featured on the pillows and the curtains. Simply dashing! 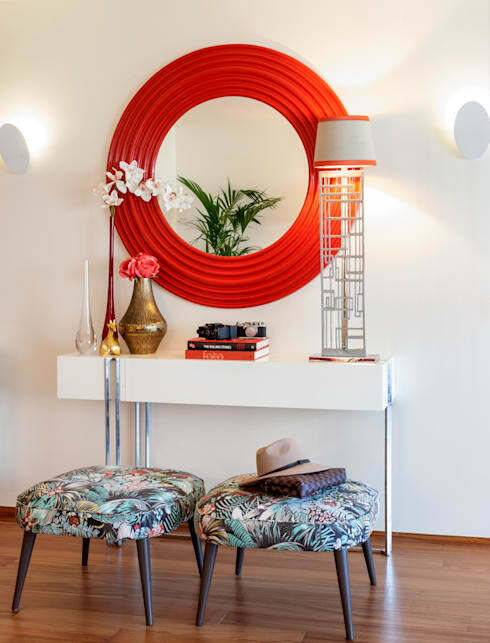 Bring in the good luck with a stunning round, red mirror like this shown above! It almost resembles a Feng-Shui, which is also a common Chinese house decor. Who says bathtubs have to be plain and boring? 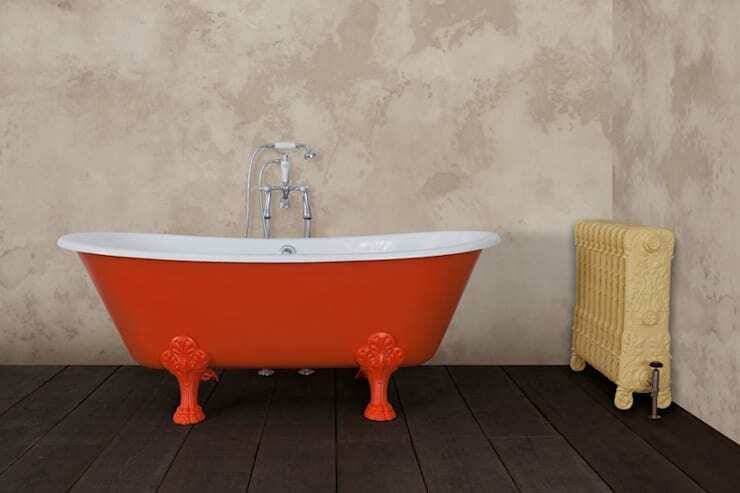 Soak all the good luck in your soul with this bold and red bathtub! 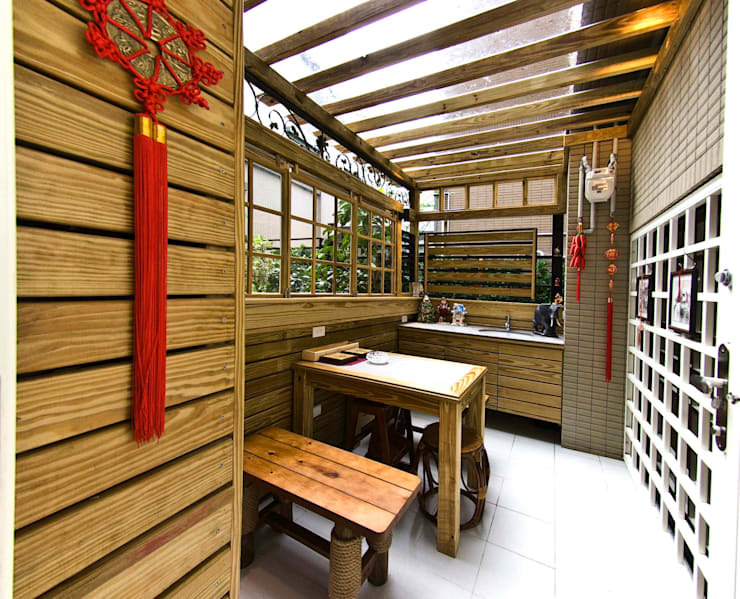 Need more Chinese-inspired home ideas? Here are 7 Feng Shui tricks that will bring you wealth!